The Wall Street Journal reports that China Mobile, the country's largest mobile phone carrier, is taking steps to assist customers who wish to use the iPhone on its network, despite official distribution being limited to China Unicom for the time being. The steps include instructions for setting up the iPhone to operate on China Mobile's network and in-store service to trim down China Mobile SIM cards to fit the iPhone 4's microSIM slot. In addition to providing instructions for how to activate an iPhone 4 with China Mobile service (changing settings to enable location-based services, for example), the website says ten China Mobile outlets around Beijing will provide a special service to help users cut their SIM cards to fit the iPhone 4's smaller microSIM card slot. 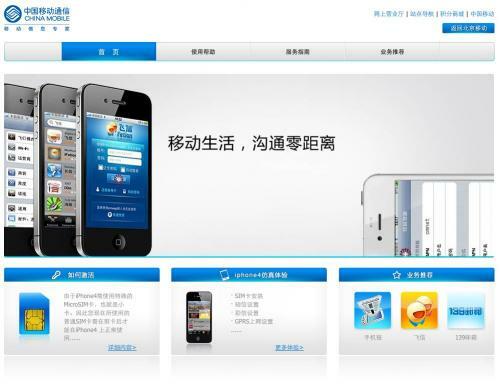 The website offers a helpline for users with technical questions and says China Mobile Group Beijing Co. "is now working hard to make the microSIM card, and it will soon be available in our outlets." China Mobile customers are showing significant interest in using the iPhone 4 on China Mobile's network rather than switching to China Unicom, despite the fact that the iPhone 4 is incompatible with China Mobile's 3G network, which runs on the Chinese TD-SCDMA standard rather than the WCDMA standard used elsewhere. China Mobile has been working for some time to gain access to iPhone distribution, but Apple has reportedly been unwilling to create a TD-SCDMA-specific handset to run on the carrier's 3G network.